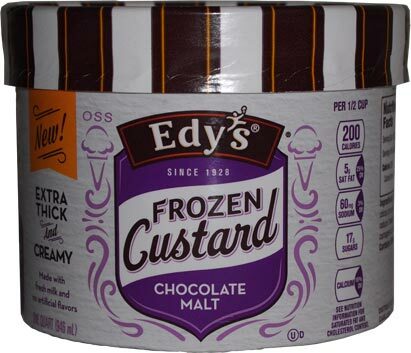 [2015-2016] I said I was pretty excited about these new frozen custards because I see it as another step Edy's / Dreyer's is taking towards reclaiming their legacy. Now I need to give it a few minutes to temper from the chest freezer, but I steal a few small bites and I have to say, this tastes more like coffee than chocolate malt. Hopefully things will change once it loosens up. Remember, custard has less air, so it's more solid than a typical ice cream, so that's why I'm actually waiting for a change. Ok, yeah, I do not like the flavor profile here. I've had several malt flavors and never has one tasted like this. 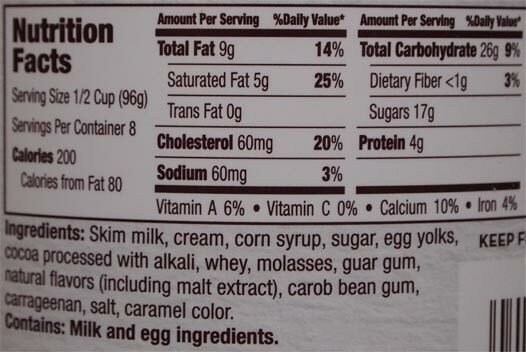 I do notice molasses on the ingredient list which seems strange to me. This custard is not malt to me, especially after having sampled the awesomeness that is three twins chocolate malt. Man, I regret trying this one first. There's just a lingering... ashtray type aftertaste. Yeah, they won't like that comment. Sorry, that's what I taste. Ok, we'll save further comments for the second scooping. 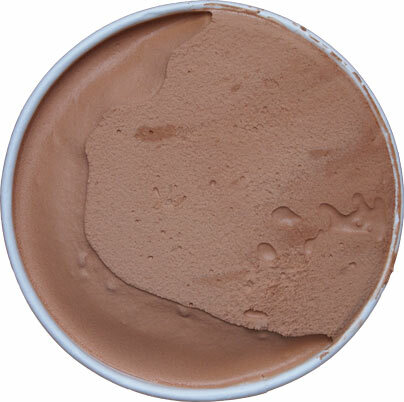 On Second Scoop: So a decent chocolate malt flavor should remind you of a milkshake.... not a cigarette. Sorry, but this one annoys me. I tried to take just a few small bites, and part of me wants to say it reminds me of chocolate soft server (flavor-wise anyway), but the rest of me is saying "No, just, No." On Final Scoop: I let this one sit in the basement freezer for two months.... and by golly.... all I can think of is cigarette. I wound up adding a ton of Nesquik and Oreos to make a half decent shake, but no fiber in my being will ever recommend this one. I don't know how they messed up so bad, but avoid this as it is easily the worst of the six new flavors. Hope it's only this flavor that's a letdown. Wonder if it would have been better with some mix-ins like Blue Bell's Malt Shoppe, but it might have just concentrated the disappointing taste. So pumped for Snickerdoodle if the stores in my area ever carry it, but a bad review from your site might make we wary. Pretty sure this will be the worst of the batch. I bought two flavors and the other is much more positive. It doesn't look too appealing. Visually it looks like the dreaded frozen dairy dessert. Your and Nick's reviews and pics help me a lot in avoiding products I probably won't like, so thank you! Texture was good, but where's the malt? Also, needs much more egg yolk. I grew up in Rochester, NY, and was raised on Abbott's custard. So when I saw (in Rhode Island) Edy's chocolate malt custard in the grocery store I was thrilled. It does have eggs in it, but you can't tell; also, I am a malt LOVER and I can't taste a wisp of malt flavor (giant letdown). 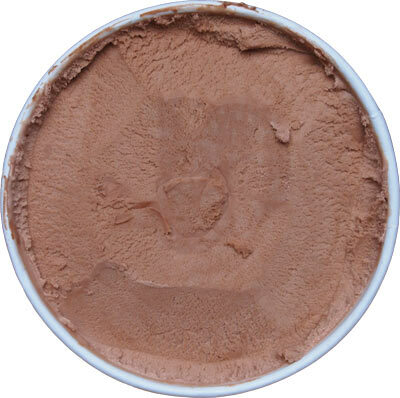 It's okay as a chocolate ice cream, it's not like I'm going to throw it out for $5.69 a pop, but they need to improve the taste. I would love it if you could have a lemon custard flavor. I actually like it! Tastes like plain chocolate to me- I would buy it again! My friends and I LOVE this flavor. I don't know what the difference was between the batch you got and the batch we got, but we (big foodies) adore it. I hope it's a continued flavor. I, too, would like a Lemon custard! As for the Malt, I love Malt, but not sure I'll try this one! A local store has the custard on sale, so, will try it, but not sure which flavors, since these comments are, only, about Malt! I tried Edy's malted custard adn loued it. It was at walmart, kroger, marsh. It was soooooo good and suddenly no more. I'm soooooo disappointed.